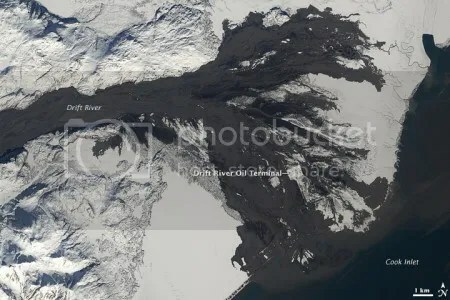 Posted by admin in activity reports, Alaska, Batu Tara, Caribbean, Dukono, eruptions, Eyjafjöll, Hawaii, Iceland, Indonesia, Japan, Kamchatka, Karymsky, Kilauea, Kirishima, Kliuchevskoi, Redoubt, Russia, Sakura-jima, Shiveluch, Soufrière Hills, Suwanose-jima, United States, Weekly Volcanic Activity Reports. 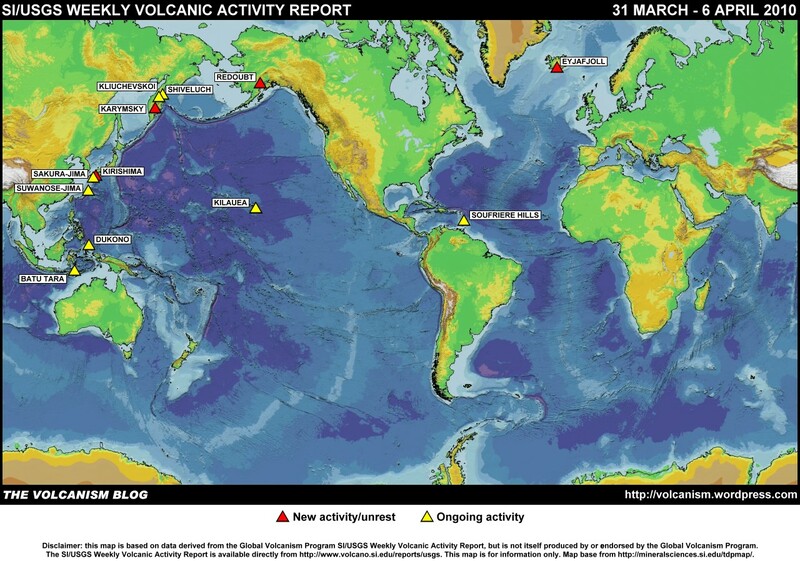 The Smithsonian Institution/United States Geological Survey Weekly Volcanic Activity Report for 31 March-6 April 2010 is now available on the Global Volcanism Program website. The following is a summary and not a substitute for the full report. New activity/unrest: Eyjafjöll (Iceland), Karymsky (Russia), Kirishima (Japan), Redoubt (Alaska, USA). Posted by admin in Alaska, Redoubt. The Universities Space Research Association Earth Science Picture of the Day for 13 February 2010 is a sequence taken by the USGS’s Bill Burton showing the first known ash emission of the March 2009 eruption of Redoubt Volcano. The activity shown in the sequence took place on 15 March 2009, and the full-scale eruption began one week later. There is a helpful and informative caption with the images, but it’s very sad to see a reputable academic site linking not once but twice to articles at a popular and laughable user-edited internet encyclopedia rather than taking the trouble to find and refer to proper sources. This kind of thing should not be encouraged: the internet is dumb enough already. A bit late catching up with this, but the Alaska Volcano Observatory returned Redoubt to Normal/Advisory status on 5 January 2010: ‘The swarm of small, shallow earthquakes that began Sunday, December 27 has ceased and the degree of seismic activity beneath the volcano has returned to background levels. Aerial observations of the new lava dome on December 31 indicated no obvious changes at the surface and no sign of instability’. Posted by admin in Alaska, eruptions, natural hazards, Redoubt. Two contrasting views of the Drift River Oil Terminal saga have been published in the Homer Tribune. Michael Munger of the Cook Inlet Regional Citizens Advisory Council presents a positive view: ‘In the recent situation with Mount Redoubt and the Drift River Oil Terminal, the unified command worked exactly the way it was intended, resulting in a successful response to the volcanic mudflow threatening the facility. As a result, no people were injured and no oil was spilled’. In the other corner, Bob Shavelson of environmental organization Cook Inletkeeper: ‘The fact remains that the Drift River Oil Terminal incident stands out as the most significant breakdown in spill prevention and response in Alaska since the Exxon Valdez Oil Spill. That breakdown put our fishermen, workers and countless families and businesses around Cook Inlet at extreme risk’. The central point is that the Drift River Oil Terminal should not be where it is. If it was not in a dangerous location in the first place none of the impressive hazard management Michael Munger talks about would be necessary. 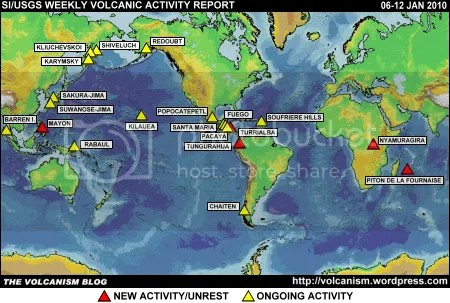 Posted by admin in activity reports, Alaska, Batu Tara, Chaitén, Chile, Costa Rica, Dieng Volcanic Complex, Dukono, eruptions, Hawaii, Indonesia, Japan, Kamchatka, Karymsky, Kilauea, Papua New Guinea, Rabaul, Redoubt, Russia, Sakura-jima, Shiveluch, Turrialba, United States, Weekly Volcanic Activity Reports. The Smithsonian Institution/United States Geological Survey Weekly Volcanic Activity Report for 23-29 September 2009 is available on the Global Volcanism Program website. The following is a summary and not a substitute for the full report. New activity/unrest: Dieng Volcanic Complex (Indonesia), Karymsky (Russia), Shiveluch (Russia). Ongoing activity: Batu Tara (Indonesia), Chaitén (Chile), Dukono (Indonesia), Kilauea (Hawaii, USA), Langila (Papua New Guinea), Rabaul (Papua New Guinea), Redoubt (Alaska, USA), Sakura-jima (Japan), Turrialba (Costa Rica). 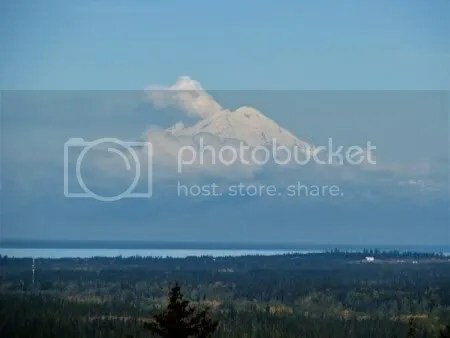 The weather around Redoubt volcano in Alaska cleared over the last few days to reveal a prominent steam plume, but this does not indicate a renewal of activity. The Alaska Volcano Observatory has confirmed that the heating of fresh snowfall on the summit is the source of the plume, and that seismic activity at the volcano continues to decline. The most recent AVO status reports say that the lava dome is cooling, and that, while the threat of a collapse remains, that threat is declining over time. Redoubt is at alert level Yellow/Advisory, but Chris Waythomas of the AVO is quoted by the Peninsula Clarion as saying ‘It’s headed toward background activity, though. I wouldn’t be surprised if it was downgraded to green next month’.